Turbocharger parts: CHRA, Complete Kits, Journal Barings, Rotor Assembly, Thrust collar, Compressor wheels, Turbine shafts etc. These thrust collars having face groove, O.D. groove and 16 oil holes are manufactured from steel 8620 or 4140 material. These are as per customers’ specification, finished after heat treatment up to 40 to 45 HRC. The dimensions are accurately maintained including concentricity, perpendicularity and parallelism , as we always intend to give the customer exactly what they need. We are among the reputed organizations, highly engaged in providing an optimum quality range of Thrust Collar. MAHAGENCO KOYNA : Insitu repairs to Generator Rotor, Thrust Collar. Karhad etc. will have to be stopped for several months. 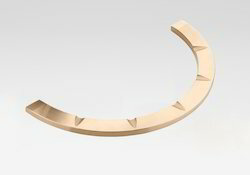 Thrust Collars provided us are of high quality with accurate dimensions. Washers, Thrust collars, Guide rings, spacers, sealing rings– fully machined for railways, light and heavy vehicles in Aluminum Bronze and Phosphor Bronze. - OEM companies refused this insitu work and advised for repairs at their work. Supply of water to Sangli, Karhad etc. will have to be stopped for several months. - We carried out this insitu work of metallizing and machining space available was 280 mm gap with baffle plates in between. 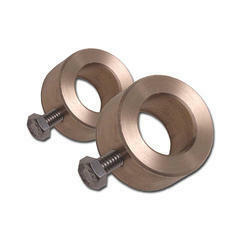 We are offering a great range of Lead Tin Bronze Thrust Collar in industries. These Lead Tin Bronze Thrust Collar are prepared with perfect quantity of material which make these collar long servicable. These Lead Tin Bronze Thrust Collar can be avail with us at industrial leading price. We provide high quality thrust collars with accurate dimensions.